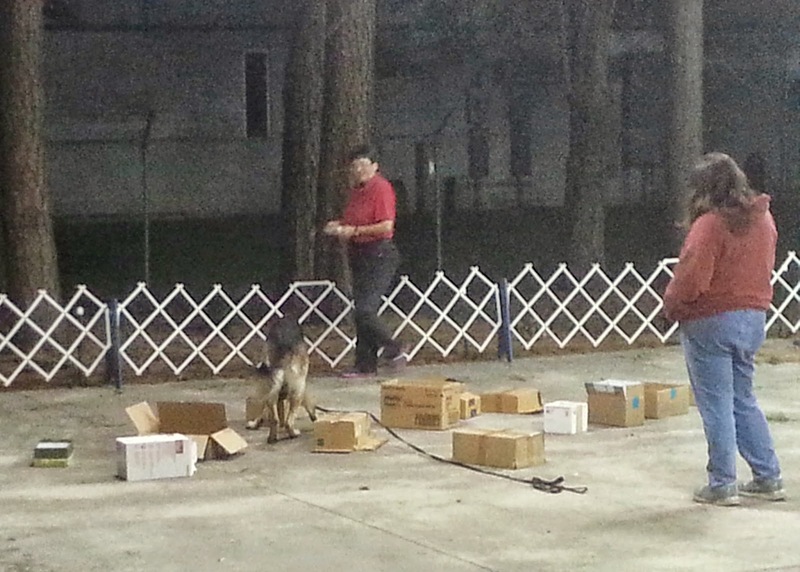 Monday was our first Find the Odor class at K-9 Obedience Club. 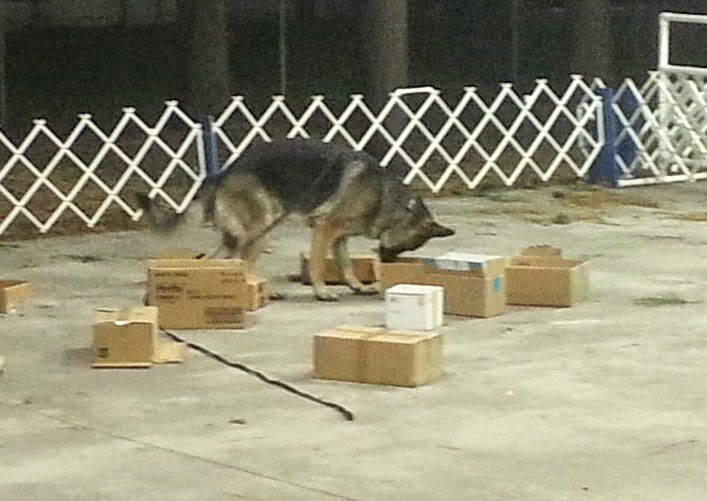 The club's training program is very similar to National Association of Canine Scent Work (NACSW), but since they trademarked the term K9 Nose Work, the club calls it "Find the Odor." This program is just like the one used to train bomb and drug sniff police dogs. Since the general public can't get explosives and narcotics to practice with, our dogs find essential oils -- anise, sweet birch and clove. Which, IMHO, smell much better anyway. Lesson one is to teach the dog to stick his head in a box. You wouldn't think that's so tough, but some dogs aren't too keen on it. The instructor scattered various boxes across the ring and stuck something really yummy inside one. (In Jedi's case it was roasted chicken.) My job was to let Jedi go and figure it out for himself. Yep, my job is to do absolutely nothing. In fact, the more I help the worse it is for the dog. Jedi figured it out pretty fast. Other dogs went straight for the instructor and tried to get the yummies from her. She ignored them and eventually they all found the right box. Lesson two is to make it a little more difficult to find the goodies. The treat box was slightly covered by another box. Jedi wasn't slowed down a bit. We've been working on it at home too. (Hubby's job gives him access to LOTS of used boxes.) We've put boxes on the couch and under chairs as well as the floor so that Jedi has to learn to search a little harder. So far, no problemo. Jedi thinks this is the best game ever! My favorite part is that I don't have to worry about heeling. (Jedi's heeling -- more accurately, lack thereof -- is embarrassing.) I just take him to the search area and let him go. I'm sure things are going to get more difficult for the both of us soon enough, but for now the hardest part is keeping Jedi from sticking his head in every box he sees. The boys brought home a couple boxes from Total Wine and Jedi had to make sure there wasn't any chicken inside. I thought it was funny (the boys, not so much). P.S. Sorry about the picture quality. Hubby took them on his phone while trying not to distract the dog. Today we're joining Rascal, Rocco and the whole Pet Parade gang! Click the button to hop around and see what others are doing today. Seriously, who doesn't like a parade?